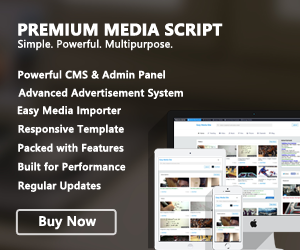 Premium Media Script is a multipurpose media script that is packed with many awesome features. It has been built from scratch with features and performance in mind. With this awesome script you are able to build your viral media site in under 5 minutes. Using the built-in tools, you can fill your site with media easily and painlessly. This script provides everything you need to propel your media site to the top with no efforts. It provides you all the tools you will need to build your media site. Add media is very simple. You can add by uploading, importing from popular sites using the URL or the bookmarklet or mass import from YouTube. Four types of media to group your media in: Video, Music, Vine, Picture. You can have a fully functional media site in under 5 minutes. Admin panels should be site owner's best friend and we have made sure it stays that way. This script's admin panel is very powerful and it gives an oversight over all of your content. Whether it is media, users, comments, reports or settings, you can control it how you want it. This script provides you the ability to customize the script your way. Change the template or enable plugins to make the user-experience unique. Furthermore, the script is open-source and very well structured so you can easily understand what is going on and extend features. A plugin documentation will be released soon allowing you to easily customize the script on the back-end. This script has many tools built-in. These tools will allow you to control your site with ease and enhance the user-experience. Some of these tools are: Theme Editor, Translation Generator, Sitemap Generator, Newsletters & Digests and others.